Wild mushrooms are one of the staples of the seasoned forager’s larder offering many flavours and textures to experiment with. However, as we all know, it can also be a dangerous pastime for the inexperienced collector as there are also many, often similar looking, poisonous varieties that grow alongside the more palatable ones. Here, Kevan Palmer of Woodland Ways Bushcraft and Survival introduces five commonly found edible mushrooms that are unlikely, due to appearance, habitat or seasonal bias, to be confused with any of their toxic cousins. 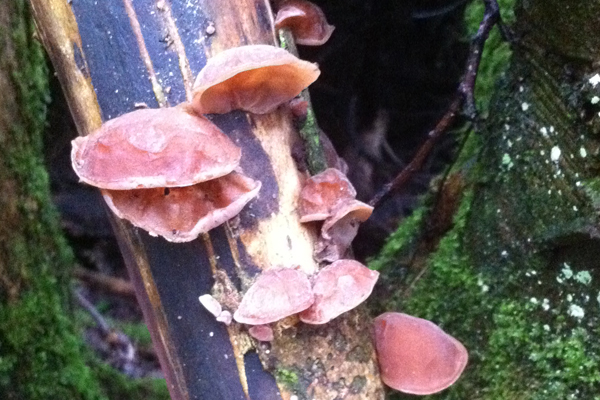 This distinctive looking fungi can be found all year round especially in damp weather. It grows on a range of dead deciduous trees but is found most frequently on dead Elder. It looks just like a pink-brown fleshy human ear. Although it can be used fresh it does have a rather chewy texture. They are popular in Chinese cooking and are best if dried first and then crumbled into small pieces ready to rehydrate and add to dishes later. Only collect Jelly Ears while they are soft, they go hard with age at which point they are past their best for culinary use. Cannot really be mistaken for anything else. Named because it appears on or around St George’s Day (April 23rd). One of only a few good edible spring mushrooms. Found in pastures, road verges, hedgerows and woodland edge. Sometimes grows in rings. Starts with a white domed cap which flattens and turns pale tan as it ages. Has a strong, mealy smell especially when young. The gills are the same colour as the cap and it has white spores. There is only one poisonous species which fruits at the same time that it can be confused with which is the Livid Entoloma. It is uncommon but can grow in the same locations as the St George’s Mushroom. 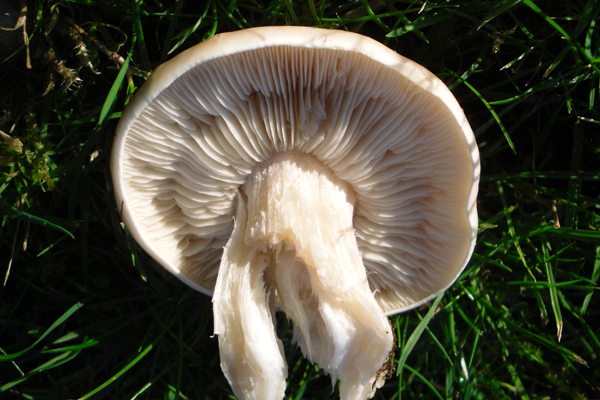 This has pale yellow gills which darken to flesh colour when mature and the spores are pink. The St George’s has a strong flavour, especially when older, but if this is to your taste it can be used in much the same way as the common field mushroom. This member of the Russula family (pic at the top of the article) gets its name from the fact that the different shades of colour on the cap are supposedly similar to the colours given by burning charcoal. The cap which starts of domed becomes flattened with a depression in the middle with age. The colour is very variable but is usually a mixture of grey, blues and purples, with green, brown and yellow in the centre. The stem, gills and spores are white. There are a few other Russula species which it could be mistaken for but none are considered toxic. It can be found from June to October, particularly in Beech woodland. 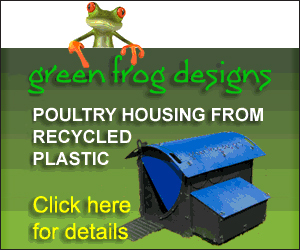 Retains its firm texture even after cooking. These two closely related species are often found growing together in large numbers in Autumn in deciduous woodland. They have a small flat cap, often with a depression in the middle. The stem is thin and quite fibrous and the gills are thick and widely spaced. 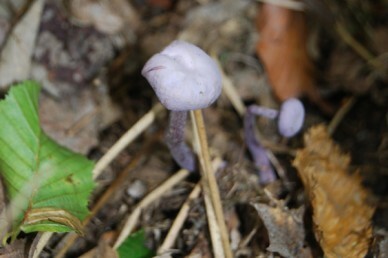 The stem and gills are the same colour as the cap which is dull brown ageing to pale brown for the Deceiver and violet ageing to light brown for the Amethyst Deceiver. 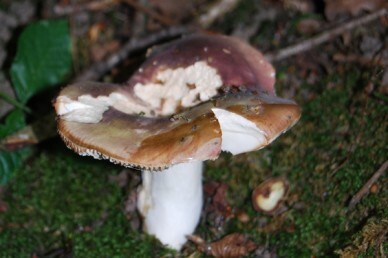 There are other brown and lilac coloured mushrooms with which they can be confused, some of which are poisonous, however, the thick gills and flattened cap of Deceivers are quite distinctive. Not a particularly strong flavour but they dry out and keep well. These are one of the few mushroom species to be found in the depths of winter appearing on dead wood particularly Ash, Elm and Gorse. They grow in clusters and have sticky, flat caps ranging from yellow to red-orange in colour. There are other species which look similar, some of which are toxic but in the Winter especially they are unlikely to be confused as there is little else that will survive the frosts . Velvet Shanks can be distinguished by their tough, hollow stems which are pale at the top and darken to dark brown or black at the base and are covered in a velvety down. Discard the stalks and clean the sticky caps thoroughly before adding a stews. Disclaimer: Please be aware that while we do our best to ensure the accuracy of information on this website Pocket Farm does not take responsibility for any illness or injury that may ensue from ingesting misidentified wild food. 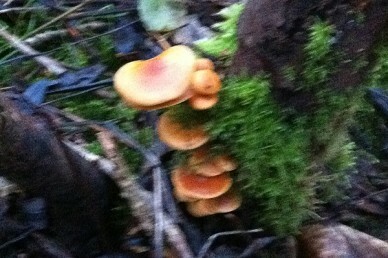 This is especially important with mushrooms which have many similar looking varieties some of which are very poisonous. We recommend that you purchase a book specifically published for the identification of fungi and, if you are in any way unsure of the species you have harvested, do not take the risk in eating them. Kevan Palmer is Senior Instructor at Woodland Ways on of the largest providers of bushcraft & survival courses in the UK. Photos of Charcoal Burner, St George’s and Amethyst Deceiver courtesy of Alec Pinkstone.